I love this book! I've checked in out from the library, but would love to win it and have it in my own home library so I can make some of the quilts! Oh this is great looking quilt. Younger grandkids really like this!!! I love the Square but Hip Owl on the cover. This looks like my kind of book. I would love to win a copy. I'm new to quilting and would love this book! Thanks for the chance! Just discovered your sight. Love your stuff and my fabulous sewing chair! Would love to try some things from this fun book. I have always thought that it was HIP TO BE SQUARE... although in my old age I am becoming more fo a globe shape! I would love to win a copy of this great book. I have read some great reviews of it. Thanks for the opportunity!! I love to make non traditional and picture quilts. This book seems right up my alley! Gotta say, I would love to win this. I love Quilting. What a great book! I can see me making tons of quilts from this book. Gotta keep those grandbabies warm! This book looks like so much fun! I would love to win it so I could make some awesome quilts. Would love to make something outside of the box! This is the cutest book ever! I really like all the detailed instructions. Thanks! sounds like a fun book, and I just LOVE the owl! I'd like to win it for that owl quilt inside. I had my youngest girl a few weeks ago. Her name is Elliette, but my 3-year old son can't pronounce that, so it comes out as "Owlet". Her theme has become owls. As a fairly new quilter, I think that the patterns in this book would be great for a beginner like me! Great cover on that book. This book would be a good helper in expanding my quilting horizons by exposing me to new, creative ideas. Love it. The Owl on the cover is very cute. Please put my name into the hat for the drawing. On FB we "like" you as Margaret Wright. If I win, I will definitely be making that owl quilt! How cute! We have a thing for owls in our family! I would love to win because the owl on the cover is so cute. Also I would love to win because winning is fun. This is a great quilt and I'm sure book!!! I also think its hip to be square! I also would like a sewnatra cabinet if that could be arranged! I Love the owl on the cover. would love to win!!!! This looks like a fun, new take on blocks! Would love to own a copy! I'd like tow in it because I love that quilt on the front! I need it! 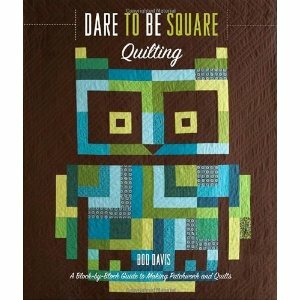 The book Dare To Be Square Quilting looks like it would be an interesting book with wonderful projects for all ages to enjoy. I would love to own one. Thanks. I'd love to win this book because "it's hip to be square!" and my squares could use some help. It looks like something new--a wondrous thing these days! I always love to do new PROJECTS from a new BOOK! The owl looks very whimsical - just my kind of a quilt! I love it hope I win. The owl on the front cover is just to cute and that would be the first thing I'd make. Thanks for the contest. Ooh I want to make a couple of these for sure. Great book. would love to make a project from this for a friend who's favorite phrase was and still is "be there, or be square"
Squaresville - so 70ish! Good memories! Awesome giveaway! Thanks! I am always looking for new inspiration for my quilting. I usually stay away from curves, so this book will be right down my alley. Oh yes, I love the squares. This quilt will be so much fun. I have 4 quilts in my head right now that need making and would love some fresh patterns.